So dudes, the other day I showed you my apprehension about approaching the water-filled plastic thing. I mentioned that my sis, Finn is one pushy broad. Don’t believe me? After Momma decided that Finn had enough of soaking herself, and that the water was all dirty, she turned it over, emptied it out, but left it sitting outside so it could dry out. Finn begged her to let her out again. I followed, naturally. Finn wouldn’t even let me near the empty thingy! She guarded it! She pushed me away from it! She jumped on me. Dudes, what is wrong with this chick? She’s nuts. MOL MOL MOL Charley I suspect Finn my actually be a mermaid in Golden clothing. Hope the pool did not get damaged, that would be terrrible! Girls just wanna have fun! Don’t you know the girlie rules yet…what’s mine is mine…what’s yours is mine and what everyone’s else’s is mine too! 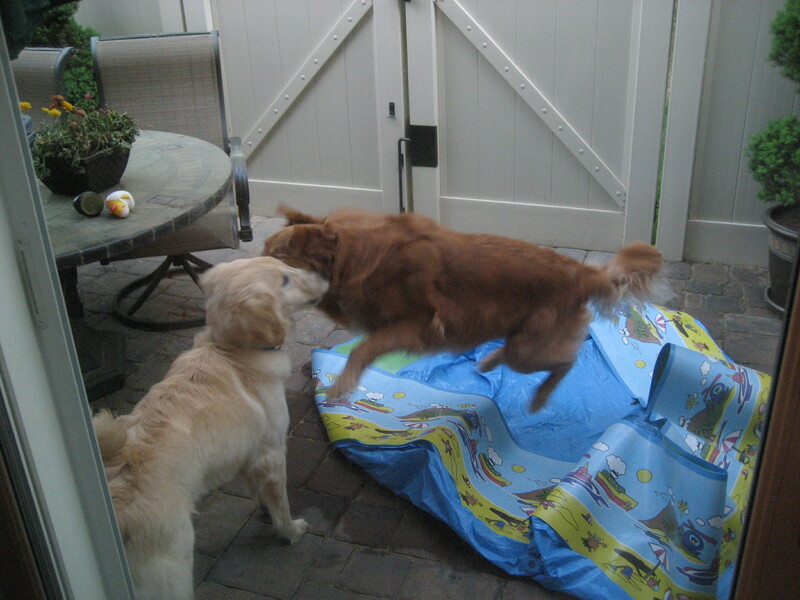 LOL Charley we think Finn might have a thing about the pool. Have a marvellous Monday. Finn is just being protective of her swimming hole! Maybe you should give her one of your treats to bribe her. We hope that next time there is water in it, you may be tempted to hop in and join in the fun. LOL!!! The last picture is hilarious. 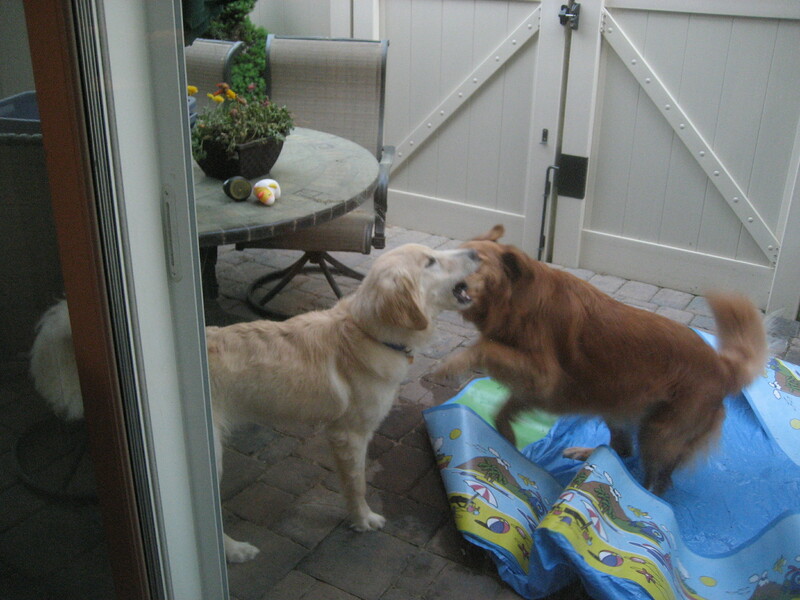 Charley I hope you figure out that the pool is fun even if its just to aggravate Finn!! Charley don’t even try to figure out the girlies. It will drive you crazy. I missed your post yesterday but this is hilarious! Poor Charlie, maybe she is saying she thinks YOU took out the water? Lol! I definitely think Finn considers the pool all hers. Love the picture of flying Finn. I suspect it’s reverse psychology: if she won’t let you in, you’ll want to get in. Those are some great aerial shots of that pushy lady! Some things are so precious they must be defended at all costs. Sorry Charley!(LOL! Remember the old Charlie the Tuna ads?) But girls really do rule the world. It’s something you will get used to in time…..
OMD CHARLEY….. I thought BROTHERS did “UNUSUAL” thingys… Next we will be seeing FINN wearing a BIKINI and TANNING Her TUMMY. WE think you should just stay AWAY from her POOL… Girrrrrls must be very… PAWsessive. Oh my! This is the side of Finny we would never had seen before you joined the family! We laughed at that last picture. Too funny! It would be much more fun with water in it. Maybe me and Stan will come by and help you fill it up! Charley I feel your pain. I think our sisters were cut from the same cloth. Finn reminds me of SOMEONE that I know personally! Just give in politely, Charley. Sissies ALWAYS get what they want! 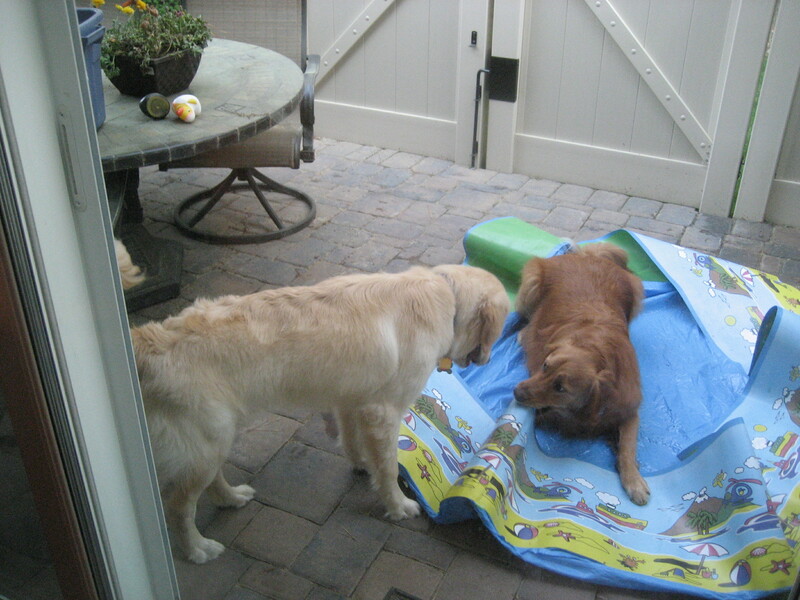 I, Greta, loves our pool but Bailey & Hazel don’t so I don’t have to share. We think Finn has decided that she OWNS it!!!! Those girls can be awfully bossy, can’t they? Maybe Finn is menopausal. Just sayin’. Finn sure likes the pool! I do that to Ma alllll the time!! She calls me a ‘bossy Princess’!! The nerves! Sure she loves her pool! WTD! Chuck…I’ve been thinkin’…how about you come live here and I send Wally to go live there? I think this crazy behaviour of your sis will definitely work in our favour when we pitch the idea to the parental units. Let me know, ok? Girls are weird!! Just look at my typist!!! Show Charley who’s boss, Finn! MOL MOL MOL Finn and Charley.. It was hers! Girls are just like that, as Monty and Sam are finding out. Love, Raelyn…. Plus Rose, my BEAUTIFULLY UNIQUE “Mystery Dog”!! We are doing everything on a phone app! Picsay is the name. The free one is good but for $3.99 you get a lot more stuff. It is so user friendly! Ha ha! I think it’s her pool now! You’ll have to be nice to her if you want to share it.